Bikers. Beautiful, tough. Disturbing yet intriguing. Their edge drives us crazy. Do you dare approach or will you admire from afar? 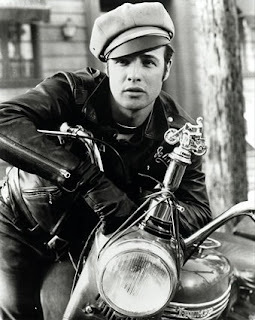 Whatever you decide you can definitely draw inspiration from motorcycle biker style if you so choose! You will also earn points for learning to work with leather as your fabric. Start your biker inspired designs by making a simple doo rag. Then go from there. While we are on the topic of motorcycles - Become a fan on Orange County Choppers Facebook page and submit your application to become the Creative Director on Paul Teutul's new TV series on CMT. Don't be shy! You have nothing to lose. Not even the cost of postage since you will submit your resume to the Orange County Choppers email address. Imagine having your resume read by the head honcho of the number one producer of custom motorcycles in the world! If you are in the Newburgh, NY area in the U.S.A. be sure to stop by the OCC Cafe for delicious food and good fun. Don't miss Karaoke Thurdsay! January 2012 motorcycle calendar babe Jessica / Kawasaki Z1000 . **Potential employment through Orange County Choppers, Inc. If you are in the Newburgh, NY area in the U.S.A. be sure to stop by the OCC Cafe for delicious food and good fun. Don't miss Karaoke Thurdsay!